Marjorie G. Scheel, age 97, passed away on Saturday, December 8, 2018, at St. Mary's Hospital in Madison. She was born on November 18, 1921 in Waterloo to Ross and Ida (Miller) Robbins. She married Gordon Scheel on May 2, 1946 at St. Paul's in Waterloo. Marjorie loved making quilts and was a member of the Lydians Society at St. Paul's in Marshall. She loved spending time with her family and friends. 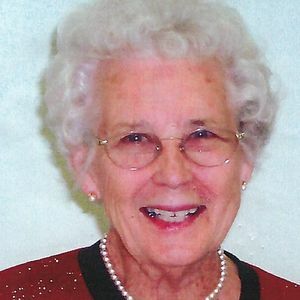 She is survived by her son Steve (Betty) Scheel; of Marshall; 3 grandchildren April Scheel of Madison, Trisha (Aaren) Christen of Marshall, and Adam Scheel of Arlington; 3 great-grandchildren Lucas, Cole and Cameron Christen; and a brother Kenneth Robbins of Lake Mills. She was preceded in death by her parents; husband Gordon; and good friend Allen Cornford. A Funeral Service will be held at 11:30 a.m. on Friday, December 14, 2018, at St. Paul Lutheran Church, 204 Deerfield Rd. in Marshall. Pastors Arthur Faught and Mark Schoeneck will preside. Burial will be at Medina Cemetery. Visitation will be from 10:00 a.m. until the time of service at the church on Friday. In lieu of flowers, memorials can be made to St. Paul Lutheran Church. Betty, Steve and family, My deepest sympathy to you and your family at this painful time. Our sincere sympathy to the family of Marjorie. Such a great aunt and her quilts were so beautiful. May she Rest In Peace with uncle Gordon. Marjorie was an amazing woman. I feel honored to have been able to spend the time with her that I did. She shared her love of her family and her church every time I saw her. My deepest condolences to her family.